When do young people start learning? From the day they are born. So why do we buy them so much useless *crap* at Christmas time? Learning can be life changing and as simple as a book, a tool, or an experience that will help set them up with life-long skills. With three little ones in my extended family I am constantly being confronted by mermaids and princesses in never ending items of merchandise they desperately NEED to possess. Surprise, surprise, a National Geographic bug catcher can also be fun! As part of the deal, a drive into the bush for a picnic was an absolute highlight. We tracked animals and identified different types of poo. They keep asking: When we are going again? For all ages an experience is definitely a great way to go. At the age of 22 my son was lucky enough to get a berth on the Young Endeavour and came back a much more mature young man. What he thought was going to be a sailing adventure was; and so much more in terms of team building and leadership. Currently Wil Massara, an enterprising young man in Western Australia who is part of my Operation Next Gen team in Collie and CEO of Youth Leadership Academy Australia, is promoting a one-day learning experience in March 2019 in Melbourne, Sydney, Perth and the Gold Coast. Now wouldn’t that be an awesome gift for a young person aged 13-18 years? As a parent there are two challenges. We don’t want to hand everything to them on a plate and we also need to challenge gender bias with our gifts. Children should learn about patience, the process of working towards a goal, and valuing what it costs to purchase something of significance. A technique we used when our children were young was to give them exactly half the money they needed to purchase that much wanted bike or pony. It was up to them to earn the other half and it was incredible how resourceful they became in the process, now that was excellent life skills learning! Why should a male toddler get a toy toolbox and a female toddler a barbie doll? Which one would be more useful building life skills? At the risk of being labelled the Grinch, I wish everyone a NO *crap* Christmas! And something else I am very passionate about … Shop RURAL this Christmas! 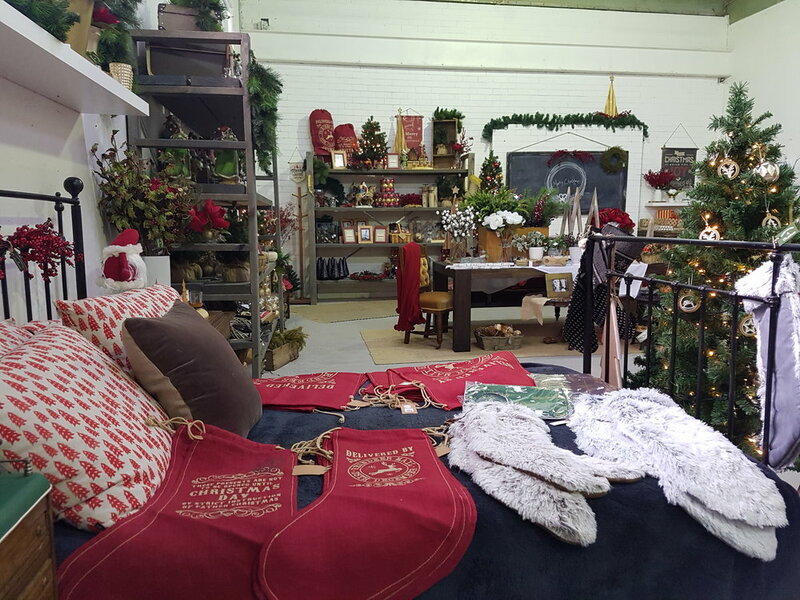 Cohuna's popular Factory & Field has introduced a Christmas section. Every dollar we spend has a multiplier effect in a rural community. Dare I say it? Yes, it’s almost that time of the year again and the start of the annual Christmas shopping frenzy. Well-meaning people are circulating messages about how we all should ‘Shop Local’ and avoid the internet. Of course, shopping local is great but it’s not quite that simple as everyone who lives in a small rural community knows. The reality is that our options are quite limited. But there is still much we can do as rural residents with buying power. Here are three tips. First and foremost we can support those few local businesses that we do have in town. Make sure you give plenty of notice of what you’re seeking and they might just be able to order it in. And a gift doesn’t have to be a product; it can also be a voucher for a service, anything from gardening to computer maintenance which my parents always appreciate. Christmas Shopping nights are a great way to raise funds for a local charity with participating businesses opening after hours and offering discounts on a designated night in late November or early December. Secondly, we can support other rural towns. My work takes me all over rural Australia so I’ve already started my Christmas shopping by purchasing the odd gift or two as I browse the shops. You would be amazed at what I found in the most unexpected places. Rural businesses tend to diversify so you can find unusual gifts in newsagents, post offices, and cafes. Recently I discovered that the Pyrenees Butcher in Avoca also stocks local beer and wines. Instead of heading to the city why not plan a pleasant day cruising around the wider district and visit other rural towns. And thirdly, in the midst of a digital technological revolution, it is ridiculous to demonise on-line shopping especially when some of those online businesses are rural based and gaining benefit from a wider geographic audience. Check out the ‘about’ or ‘contact’ section to see where they are located. You may well find that you are supporting a young person in a rural community such as my own daughter whose business, Fair Dinkum Dog Coats, is totally online. Every dollar we spend in a rural town has a multiplier effect in a rural community. It helps keep small businesses alive and retains jobs for local people. In this day and age of being reminded constantly of how we need to take better care of ourselves, it seems unfair that customer expectations of small businesses are not in tune with this sentiment. As any holiday period approaches I am reminded of how tough this is for small family businesses in the retail and hospitality sectors, particularly those located in rural towns. We used to keep our retail shop in central Victoria open seven days a week all year round but the increased penalty rates put an end to that about five years ago. While the university students we employed on weekends were keen to continue, our profit & loss spreadsheet said differently. Clearly our core customers were locals during the week, not the tyre kickers that love to browse the shop enjoying a leisurely weekend in the country. Every business is different but this was the case for ours. Up until that point we were happy to provide much needed employment and keep the shop open as a courtesy to other tourism related businesses around us, but now the figures were against us. We had a choice. We could work seven days a week all year round ourselves, or take time off to enjoy with our families and keep ourselves healthy for the six days we are required to work extremely hard. Getting away for at least one or two weeks a year of uninterrupted leisure was another dream we had. Even better if we could do it together as a family rather than taking turns to mind the shop. To us it was a no brainer but to the wider public it is not always so clear. Slowly we have all crept into the expectation that we can shop and do business on any day of our choosing. Community leaders lament the fact that so much business is being lost as tourists drive through their rural towns on weekends and public holidays. I’m constantly asked ‘What can we do about it?’ as if it is the fault of small business owners. Well my suggestion is for community leaders and small business owners to communicate better. Proactive business communities may be able to negotiate for business closures to be staggered throughout the year. Most of all, everyone needs to communicate why closures are necessary. Be loud and proud that small business is the backbone of our economy. Explain that small business owners are spending time with their families and look forward to giving great service on re-opening day. All it takes is a sign on shop windows, a notice on websites, and courtesy reminders to core customers.